The Cadillac ELR is a plug-in hybrid coupe from the General Motors luxury brand, new for the 2014 model year. It is a front-engine, front-wheel-drive two-door compact coupe. General Motors first showed the car, in concept form, at the North American International Auto Show in Detroit in 2009, where it was called the Cadillac Converj. News of the Cadillac Converj, over the next few years, was full of conflicting information, as General Motors watched slow sales of the Chevrolet Volt and tried to figure out if the Cadillac Converj could be built and sold at a profit. Timeframes for production and distribution of this new electric hybrid were pushed back several times. The final production version of the Converj, which became known as the Cadillac ELR, was revealed at the North American International Auto Show in 2013, and the car became available in December of that year. The Cadillac ELR is built at a General Motors facility in Detroit, Michigan, alongside the Chevy Volt as well as the Opel Ampera and Holden Volt, which are plug-in electric hybrid vehicles built for the Opel and Holden brands. Opel and Holden vehicles are designated for GM’s export markets and are often built outside the United States, but General Motors’ Detroit facilities are the best equipped for production of electric vehicles. General Motors has said that it is considering exporting the Cadillac ELR to global markets such as China and Europe, but the auto manufacturer has not set a timeframe for this potential international distribution. The Cadillac ELR is the third electrically powered passenger car to be produced by General Motors for the United States market after the discontinuation of the GM EV1 electric car, following the Chevy Volt and the Chevy Spark EV. 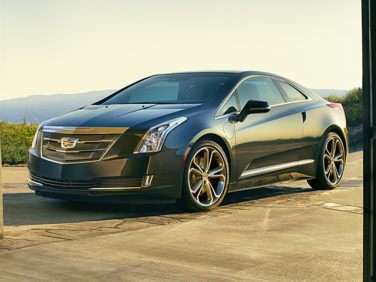 The Cadillac ELR is based on the series hybrid drivetrain technology that’s found in many other hybrid vehicles, although, unlike most gasoline-electric hybrids on the market, the Cadillac ELR is a plug-in hybrid capable of traveling solely on electric power for a short time. The actual powertrain in the ELR, composed of the 1.4-liter four-cylinder gasoline engine and electric motor, is a version of the Voltec system found in the Chevrolet Volt plug-in hybrid, although it has been retuned and refined for better efficiency. The battery pack in the Cadillac ELR is a 16.5 kWh lithium-ion unit. Power is put to the wheels through a continuously variable transmission. The Cadillac ELR’s battery and electrical components produce 157 horsepower, but the entire drivetrain, when using the gasoline engine, yields a total of 217 horsepower. General Motors has said that the engineering team on the Cadillac ELR focused on extending the vehicle’s electric range, to make the car as flexible as possible. The Cadillac ELR can travel on full electric power for about 37 miles, and the vehicle’s total range of combined electric and gasoline power is about 345 miles, depending on driving conditions. The top speed of the ELR is 106 miles per hour, and the vehicle can accelerate from 0-60 in 7.8 seconds. The Cadillac ELR can be charged with a 120-volt charger that takes between 12 and 18 hours for a full charge. Using a 240-volt home charging station, this time drops to about five hours.